How do you compare these 2 portfolios? Of course, you can use the Expected Value metric to compare these 2 portfolios. But 'expected value' cannot be used confidently to compare 2 portfolios or random variables all the time. Stochastic Dominance is a very strong set of rules that can be used to rank random variables. Now, If you expand the Options Analyzer for the above tree, you will see the Stochastic Dominance panel. You can expand the stochastic dominance expander and then you will see the picture like this. If you expand the Stochastic Dominance expander, then, it will show which option dominates another option in stochastic dominance or deterministic dominance. Anyway, the stochastic dominance is calculated only when the user expands the panel (because it is a little bit time-consuming operation). 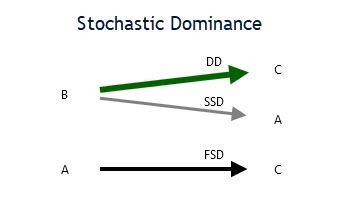 FSD = First Order Stochastic Dominance. Here is an example view of the Stochastic Dominance Panel where A, B, C are various Actions. Once the stochastic dominance is calculated, in addition to the stochastic dominance panel, the tooltip on the action name in the Risk profile chart displays the stochastic dominance information as well. You can easily get a sense of Stochastic Dominance by viewing the Cumulative Distribution chart and the Survival function chart of the Risk Profile. If you click the CDF button, you will see the same Risk Profile in the Cumulative Distribution form. So, you can understand how one action dominates another action by the stochastic dominance.